I have been a little quiet of late. Packing up a house and moving just before Christmas is not ideal at the best of times, let alone when one has the job of recipe developing, testing and trying to cook delicious food from a half-packed kitchen… Yes, we are moving – there will be a garden, fresh herbs and I even envisage a small vege patch – a zero waste kind of set up. 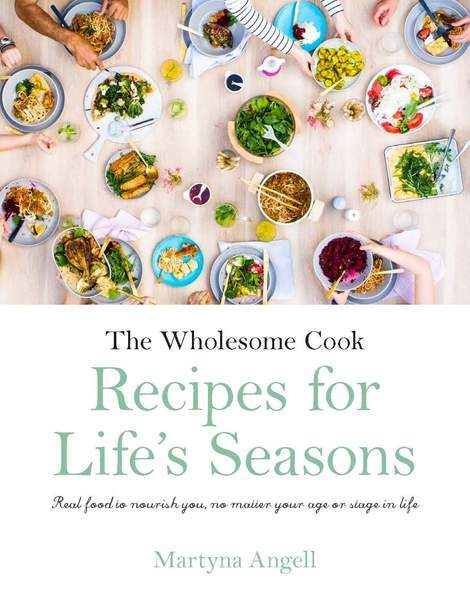 While I’ll be posting a few recipes over the coming weeks, including some seasonal treats, my focus will be on quick and simple meals in minutes and one pot wonders. I’m sure there are days when you’d rather be doing something else than stand over the stove cooking complicated dishes from recipes you only half understand. If there is one thing I like to have on hand on a day like today – warm and packing boxes, is seedless watermelon. Come warmer weather, I like to be stocked up and I like my watermelon chilled. I have previously professed my love for the watermelon and haloumi combo, which has become so much of a popular dish at our local wine bar that a tapas bar nearby has basically ripped off the idea, quite poorly I might add. This time I have decided to do something different, mostly because I only had feta in the fridge and did not feel like climbing the giant 84-step staircase up from the supermarket in this heat. Combining cubed watermelon, sliced strawberries, fresh mint and some salty feta makes up for a quintessential summer salad. Add a dash of aged balsamic for extra flavour and you have a great snack or supper that will refresh and rehydrate like no other. To make the salad: combine watermelon, strawberries and mint in a large bowl. Toss gently to mix. To serve: place the mixed ingredients into a serving bowl, drizzle with balsamic and sprinkle with crumbed feta. Congrats Marty! how exciting, your own garden with fresh veges. PS the salad looks amazing for a warm evening. That’s awesome! I love this recipe, but have to admit I’m a bit jealous right now. I mean look at those berries. That sounds so refreshing! Good luck with your move – it sounds full of possibilities! And I have all ingredients at home. I could make this! So simple and tasty. All the best with the house move. In Greece the combination of watermelon and feta is a classic. I was thinking of exploring a version of the Greek salad with watermelon instead of tomatoes. Nice touch the strawberries. Reminds me of a Mark Bittman recipe. I love salads with just a couple of ingredients. Beautiful! oh my! strawberries are my favorites! 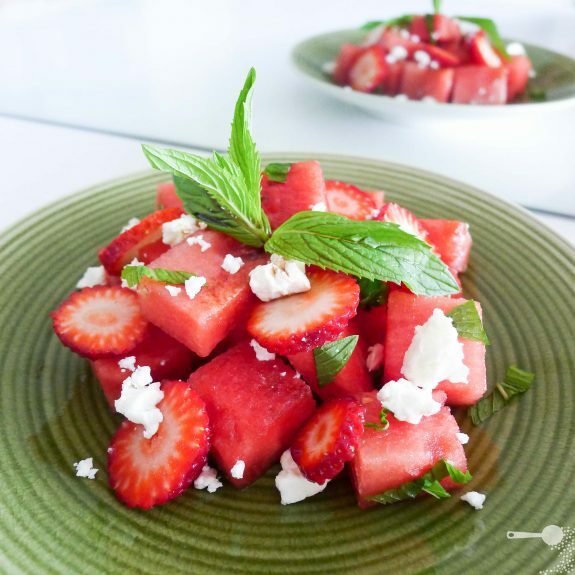 I have had watermelon and feta salad before, is one of my faves to make during the summer months, but have never added strawberries. Your recipe is simple, stunningly colourful and just perfect for summer. It’s so nice to dream about Summer watching Australian bloggers’ recipes. For me it looks now almost like science fiction 😉 I have never combined strawberry and watermelon. I must remember it next Summer. It looks fabulous. I’ll have to give this a go for christmas lunch! I want to make this. Love the flecks of feta! Congratulations on moving to a new home. A vege and herb patch is always exciting for the home cook! This recipe looks deliciously simple too. I LOVE watermelon and feta salad. The first time I served it was with olives, lemon zest and a drizzle of olive oil and balsamic vinegar (minus the strawberries), as a side to a greek-style roast lamb back strap. Bloody awesome!!! The addition of strawberries is fascinating, will have to try it with that next time. YUM! this is actually a traditional greek recipe that my father use to make for me all the time when I was a little kid. He also use to add honey melon as a little twist which is very beautiful indeed. Nice pics btw!